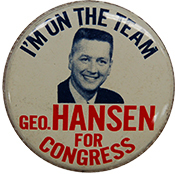 HANSEN, George Vernon, a Representative from Idaho; born in Tetonia, Teton County, Idaho, September 14, 1930; attended public schools; B.A., Ricks College, Rexburg, Idaho, 1956; did graduate work at Idaho State University, 1956-1957 and 1962-1963; graduated from Grimms Business College in 1958; served in the United States Air Force, 1951-1954, and was a graduate of the U.S. Army language school; officer in the United States Naval Reserve, 1964-1970; grain elevator manager, 1950-1951 and 1954; public school teacher, 1956-1958; engaged in the life insurance business, 1958-1965; mayor of Alameda, Idaho, 1961-1962; upon consolidation of Alameda and Pocatello served as city commissioner of Pocatello, Idaho, 1962-1965; director of the Idaho Municipal League, 1961-1963; unsuccessful candidate for the United States Senate in 1962; delegate, Republican National Convention, 1968; elected as a Republican to the Eighty-ninth and Ninetieth Congresses (January 3, 1965-January 3, 1969); was not a candidate for reelection to the Ninety-first Congress, but ran unsuccessfully for the United States Senate in 1968; deputy under secretary for congressional liaison, deputy administrator for Agriculture Stabilization and Conservation Service, and vice president of Commodity Credit Corporation, United States Department of Agriculture, 1969-1971; returned to Pocatello and engaged in private business pursuits, 1971-1975; unsuccessful candidate for nomination to the United States Senate in 1972; elected as a Republican to the Ninety-fourth and to the four succeeding Congresses (January 3, 1975-January 3, 1985); reprimanded by the U.S. House of Representatives on July 31, 1984, for conviction on four counts of making false statements related to financial disclosure forms; was an unsuccessful candidate for reelection to the Ninety-ninth Congress in 1984; chairman of a political consulting firm in Washington, D.C.; died on August 14, 2014, in Pocatello, Idaho. Papers: In the Time Capsule collection, 1976-1980, 8 items. Correspondents include Hansen. Papers: In the J. Arthur (Jesse Arthur) Younger papers, 1951-1968, 12.5 linear feet. Hansen included among subjects covered. Papers: In the Carl Albert collection, 1910-1998, 697 cubic feet. Hansen included among correspondents. Hansen, George V. "OSHA: A Nightmare About to End." In Can You Afford This House?, edited by David Treen, 71-81. Ottawa, IL: Green Hill Books, 1978.